🎉 Congrats to Donald H. You just won $100BTC. Expect an email from us later this week with more details. And thanks to everyone who participated in the CoinSnacks Summer Giveaway. Coinbase continues to roll out cryptoasset offerings for not only institutional investors, but for newcomers as well. Their latest product, Coinbase Bundle, aims to offer users a “starter pack” of cryptocurrencies that trade on the platform. The five currencies included are Bitcoin, Ethereum, Bitcoin Cash, Litecoin and Ethereum Classic. The allocation of tokens will be weighted based on the market cap of each currency at the time of purchase and users will be able to buy the bundle for as little as $25. …A little late to the party on this one, Coinbase. Nevertheless, we applaud their focus on quality, introductory education. It’s that important. So for anyone who has close relatives that “still don’t get it,” you now have another place to send ’em (aside from CoinSnacks, of course)! We don’t often post overarching bullish tweetstorms in Must Reads… but we thought this was an exception. Courtesy of @iamjosephyoung, here’s the bigger picture you should look at. One platform. All your exchange accounts. Quadency is an advanced digital asset trading platform for both active traders and long term investors. Manage your holdings across exchanges and say goodbye to missed opportunities with a holistic, real-time portfolio dashboard AND advanced trading features built right in. 🔒 Tony Sheng: Is (Just) Some Privacy Worth Anything? “I’ve got nothing to hide, so what’s the big deal”? Tony Sheng argues that this dangerous thought process may not impact people directly today, but it impacts the society we live in. Sheng gives his take on how surveillance leads to marginalization, and why he believes the crypto industry is taking too many half measures. 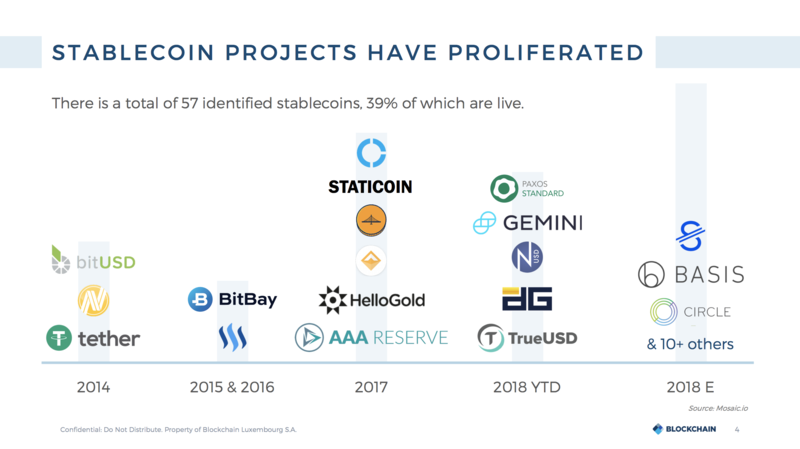 In timely fashion, Blockchain.com’s latest research report gives us a comprehensive overview of the state of the stablecoin market. The report (too many interesting observations to go into depth here) is a must read for anyone interested in learning more about the latest crypto craze. Michael del Castillo for Forbes Magazine makes the case that companies like Google see Veem as the solution to reconfiguring the way money moves by simplifying the cost structure and giving money back to the user. Take a seat Ripple (XRP), there’s apparently new competition in town. Given that Ripple wants everyone to use XRP as the base currency unit whereas Veem uses Bitcoin (instead of their own native token), we think Veem will be perceived as a more neutral competitor. Huobi exchange acts as one of 21 block producers on the EOS network, and is now coming under allegations that it has been buying and selling block producer votes with EOS. This isn’t the first controversy surrounding EOS, and certainly wasn’t a surprise to anyone, including Vitalik Buterin who tweeted his $0.02 on the issue. This segways beautifully into why people need to read more pieces like the one posted this week by Vlad Zamfir called “Blockchain Governance 101.” Zamfir outlines how he feels the blockchain governance regimes of a small number of major blockchains will determine governance outcomes for the entire blockchain space. A report by the Bank for International Settlements (BIS) has found that regulatory actions do indeed have a huge impact on crypto markets. BIS claims that while markets do not generally respond to news about central banks creating their own digital currencies or issuing non-specific warnings about cryptocurrencies, they show a significant response to regulatory announcements regarding the legal status of cryptoassets and initial coin offering (ICO) tokens. This isn’t the first time we have heard about inflated volume on cryptocurrency exchanges and it certainly won’t be the last. The latest newcomer to the controversy is BitForex, who is consistently reporting daily transactions that exceed $5 billion despite the fact that traffic on its site amounts to a tiny fraction of most peers. Why is this a problem? For retail investors lured to exchanges with inflated volumes, cashing out at the price they want may be very difficult. Calls for increased clarity on crypto regulation are now coming from Congress, not just crypto enthusiasts. More than a dozen members of the House of Representatives sent a letter to Securities and Exchange Chairman, Jay Clayton, Friday urging his agency to tell investors, in plain English, how it plans to regulate cryptocurrency. This is timely news, as judicial decisions on crypto are being made across the country. A federal judge on Wednesday ruled that virtual currencies meet the definition of a commodity and fall within the jurisdiction of the U.S. derivatives regulator, allowing the agency to pursue fraud allegations against perpetrators such as My Big Coin Inc. Need a refresher on the My Big Coin scandal, an ELI5 walk-through of today’s ruling, and an opinion of why the federal decision is “deeply flawed,” Jake Chervinsky took to Twitter to explain it all. In regards to the Wanchain (WAN) chart above, we see a retracement ready for a move up compounded with an ascending triangle (bullish reversal pattern). Other notes include an ascending RSI (relative strength index), a hefty pickup in volume, and a moving average reversal. Bitcoin runs on paranoia… that’s the beauty of it.